Only One Month Left!….and a quick reminder…. Can you believe where the time has gone? Me either but seriously there is only ONE MONTH LEFT of Sale – a – Bration! Sale – a Bration ends on 31st March 2012 and those stamps sets and Designer Paper will no longer be available again – EVER! ONE MONTH only! to get your FREE stamp sets and Designer paper. How DO you get yours? Simply place an order for £45 with me before 10.00pm 31st March 2012 and choose your FREE stamp set or Designer paper. For every £45 you spend you get another item! Couldn’t be simpler, I know! What can you choose? Well simply click on the link below and make your choice – they are fabulous! Here I used the Sprinkled Expressions stamps to create a set of cards that could ]easily be given as a gift and the best part? they take moments to make so if you need lots of alternatives to giving the usual Easter Egg, these won’t take you long! A quick reminder that we have some Fabulous classes coming up…. The first is our Stamp a Stack! – It is on 17th March at Table Table, Phoenix Park, Linwood. The cost is £15 and we will be making around 10 cards with a Spring/Easter theme. Fresh Crafting Friends Offer – We all love to craft with friends so if you bring a paying friend who has never been to one of my classes before, I will give you a gift of 6, 6×6 Everyday Enchantment Papers and co-ordinating ribbon set as a thank you for bringing your friend to craft with us. Just book her place over on my blog using the PayPal button and I will have your paper and ribbon set waiting for you on the day! Wow! Does it get any better than that? Well actually yes it does…. Need some ribbon but don’t want the whole nine yards? I have the answer to that then! 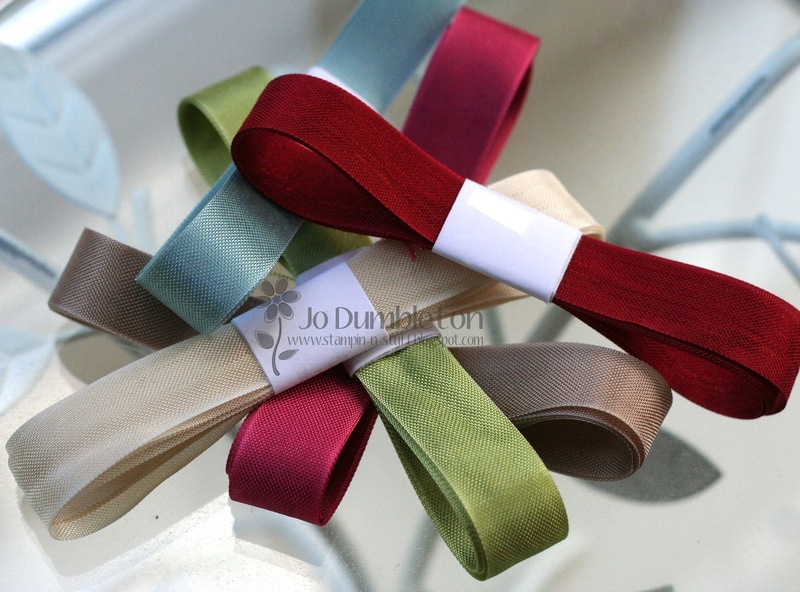 You can now get ribbon sets that contain a yard of each colour of ribbon! FOR A LIMITED TIME ONLY there are 3 different bundles with all the colours from each style. You will receive 1 yard of each colour in that particular style and because it’s SALE-A-BRATION you’ll also receive 6, 6×6 sheets of the Everyday Enchantment paper with each bundle. Isn’t that just the best offer yet? n.b. Always Artichoke is missing from this picture but will be included in the bundle. 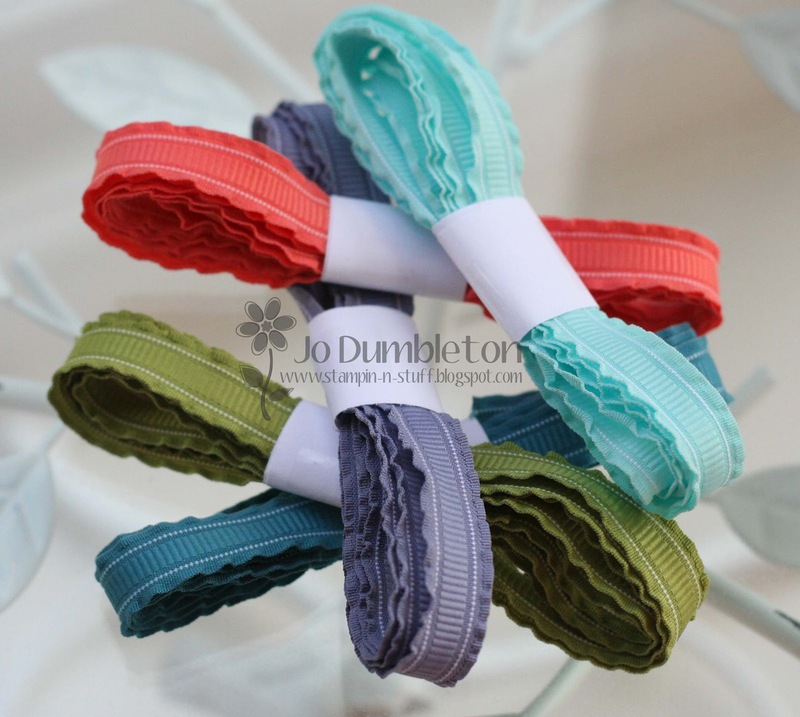 Also did you spot that these lovely pictures came from Jo Dumbleton? Yes this is her idea that I couldn’t resist but bring directly to you! Brilliant Thinking Jo! 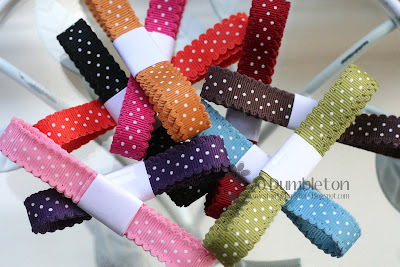 Please drop me an email at stampdelicious@gmail.com stating which bundle you would like. If you would like ALL the bundles postage will be FREE and of course you will receive 3 lots of the Everyday Enchanchment papers! And finally….It has been one of those weeks. Not my best I can assure you, hence the slow showing of our Sale – a – Bration ideas this week. Cant really put my finger on what is not feeling right for me but having a head cold hasn’t helped me think it through. I have a huge amount to be grateful for, my family are all healthy and busy with their lives, my BH is in a good job and my sons are working towards end of year exams, we certainly have things alot easier than many folks. But still, I have had a couple of down days. Probably the weather which has been pretty miserable so far this year and the lovely spring blooms which generally cheer me up no end have not yet peeked their heads out. So my challenge to myself before my next post is to create some lovely cheering blooms cards to brighten my craft room on these still dark and miserable days! Roll on the brighter weather and look out for those cheering blooms!